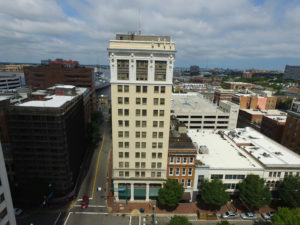 Clancy & Theys Construction Company is quickly approaching the finish line on the renovation of the historic Royster Building in Norfolk, Virginia, which is slated for completion in August 2019. The space is being converted into the new Glass Light Hotel, a 100,000‐square‐foot boutique hotel featuring 117 guest rooms, two meeting rooms and two board rooms, in addition to an upscale French restaurant and bar located on the ground floor. The Glass Light Hotel will join Marriott’s Autograph Collection, a group of more than 100 independently‐owned properties around the world recognized for their character and focus on art and design. The hotel will preserve the Royster Building’s charm and history with a display of local and international glass art, weaving the story of the historic building into the unique hotel. The Royster Company, a fertilizer manufacturing firm, originally built The Royster Building in 1912 to serve as an office building and lab. The company maintained its place on Granby Street in Norfolk for more than 60 years. Clancy & Theys is working to bring the building’s 104‐year history to life for future guests by preserving historic elements of the structure. Read more about the Royster Building renovation from the Virginian‐Pilot or Southside Daily.